The Glion has been referred to as the perfect electric scooter for commuting by many customers that already bit the bullet and invested. In essence, it’s a highly portable mini-scooter suitcase ready to help transport you everywhere and anywhere you need. 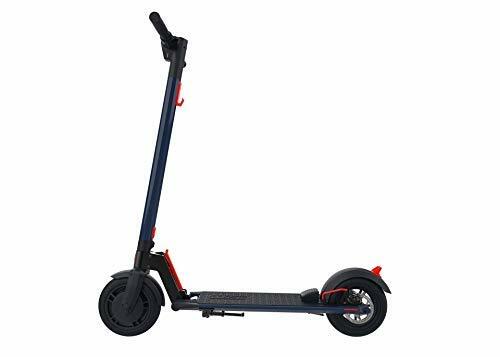 The 250-watt motor is contained within the front wheel and at its fastest, can carry the rider at up to 17mph. These are definitely commendable speeds. This maximum, however, may vary depending on the weight of the rider and the terrain that they will be making their way through. If the surfaces are more inclined and have more cracks and bumps, slower speeds will be necessary. Most customers are first deceived by the simple appearance of the Gotrax. The majority of the people that pass by, write it off as a simple kick-scooter without any motorization. It looks slim, and curiously enough, doesn’t look like it has the motor located anywhere within its design. That, however, is a false assumption, since even with its attractive design, the GLX is a small yet powerful commuting device with the motor present discretely at the front. You will be able to ride freely without worrying that an under-deck battery will catch on a curb and destroy your whole scooter! The motor itself is chain-driven, which means you can say goodbye to your worries about pollution. Some chain motors are often reported to come ‘off track’ when used extensively. The Gotrax, however, stays clear from issues like this, which results in a safe, reliable ride whenever you need it. All you need is a kick-start and you will be well on your way to cruising the boulevards! The fortified framework is fantastic and is designed slightly differently than what we can see in any other regular scooter. 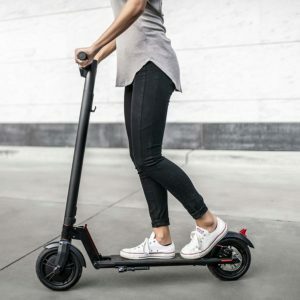 It definitely looks more modern, and more ‘clutter-free’ than a variety of several other motorized scooters available on the market today. There are no wires sticking out from anywhere, there is no overall bulkiness, and the deck is slim enough to allow riding over curbs and cracks safely without damaging the device. Many customers have testified that over years, the frame stands the test of time flawlessly. The main handlebars are thick enough to provide the rider with balance and confidence, but thin enough to give the modern, slick appearance that everyone yearns to have when gliding. The GXL has a reliable handlebar display where you can track how much battery you have left, your current speed and the headlights. This quick accessibility is ideal for having an efficient ride, where you can get quick data on the battery and speed status whenever you need. Everything is at the tip of your fingers whenever you need it. The Gotrax has very responsive and sensitive brakes that will respond to all of your moves that initiate pausing the ride. The brake is hand-controlled and is located at the side of the handlebar, however, you can also easily stop by putting your foot down when gliding. A combination of both braking techniques will ensure that you get to stop whenever you need, whenever you want, and as quick as you desire. You will be getting a secure stop at all times, no matter how treacherous the ride. Other braking options, like the backup rear disk brake, involve pushing your foot on the back cover of the rear wheel. This will gradually slow down the speed of the scooter, and allow you to reduce speed bit by bit. One of the best features of the Gotrax includes its ability to slow down as fast or as quick as you like. If you feel like slowly pulling up to a curb, you can easily do so, on the other hand, if you have to immediately pull to halt due to other circumstances, the GLX will stop immediately. It also won’t throw you off, as long as you have a solid grip on its sturdy frame. The Gotrax has been manufactured with 8.5” pneumatic tires intact. These big rubber wheels are slightly thicker than the wheels on other motorized scooters. In essence, the thicker and bigger the wheels and tires, the more shock absorption they can handle, even if the ride may get bumpy. If you live in a rougher area where the pavements are more uneven, cracked and full of small stones and gravel, then the GXL will handle all of that splendidly. You will be able to cruise mostly without worry, however, you might want to stay off full dirt roads, since such extreme terrains may indeed wear off the scooter a bit too much! Both wheels are made out of solid and sturdy rubber, which provides you with a solid grip and resistance when riding. You won’t be slipping even on flat terrains; the GXL will give you a solid, secure ride wherever and whenever you need. All in all, the GXL can handle going at about 17mph. This is undoubtedly a good speed when cruising around crowded pavements or quiet neighborhoods. It’s perfect for getting around quickly and efficiently, and being ‘efficient’ is the main motto of the Gotrax team when manufacturing their scooters. The maximum speed, of course, also depends on other factors. Factors like the rider’s weight, the terrain they are intending to ride on, and the inclines of the surfaces around them. 17mph is the optimum speed available, however, the scooter can also go faster or slower, depending on the factors mentioned previously. The Gotrax team that tested the scooter tested it under ideal cruising conditions, that’s why we recommend to not get discouraged if the scooter goes a bit slower on rougher terrains. One thing you should keep in mind is the fact the Gotrax will be able to transport you quickly, at all times. It can handle as much as a 12-degree incline, which is an impressive achievement for such a slim device. 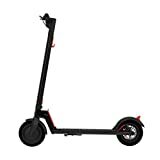 The GXL features a Lithium-Ion battery of 24V battery, which allows the scooter to be as durable and as efficient as it is. One of the biggest fortes of the Gotrax is its quick charging ability. Commonly, the motorized electronic scooters on the market require up to 12+ hrs of charging after each use, and they only last for about 40 minutes worth of riding. For people who need to get around, that’s simply not enough to justify their price. The Gotrax charges within 3 hrs, and rides for up to 9 miles before it gives way to exhaustion. This is a very solid amount of miles, especially for such a thin and slick scooter. Once again, the smart design and efficient thinking behind all of the GXL features is hard to rival by other companies. In the busy world that we live in, having portable gear is absolutely necessary. Luckily, Gotrax took care of that aspect of the scooter too. The frame can be easily folded and carried single-handed. This makes life 100% more efficient, especially since most of the time the people who will be using the scooter need to commute. Commuting, in general, can also mean getting from train station to the bus stop, to campus or workplace. The deck of the scooter is 7.6” wide, which makes it ideal for being stable when standing on it with both feet. Thanks to this design feature, this makes the electric scooter 100% suitable for adults, as well as kids. Commuting for everyone is made easier when they can easily balance and glide without worrying about slipping off. Another great addition is the LED headlight. It’s installed at the front and helps you keep yourself safe and sound when the night falls and you are still cruising home. The Gotrax weighs about 264 pounds and can handle any rider that weighs around 264lbs. That’s definitely a wide support range of riders, and one of the reasons as to why the GXL is so popular among all age groups. It supports many riders and also has the perfect dimensions for everyone to be able to ride comfortably. The unfolded dimensions of the GXL equal to 100 x 15.9 x 36.7 cm, while the folded dimensions sum up to 100 x 36.7 x 92.2. When folded, the scooter is ideal for carrying around onto transport and can be easily unfolded within seconds. The Gotrax is a perfect electric scooter for kids, teenagers and adults alike, no matter what age they are. Usually, the scooter is generally recommended for people who need to commute a lot every day. Whether that’s for school or work, the GXL will be ideal for both scenarios. It can definitely run for a long time on a single charge if all you do is ride to and from school. Recharging so rarely definitely saves bills and is a good thing for kids an adults that tend to forget to charge the day before! The Gotrax GXL is maintenance free and can handle a lot of the wear and tear that you throw at it. 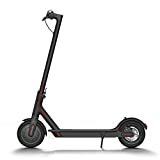 It’s perfect when it comes to transporting and commuting, it’s easily portable thanks to its folding function, it can travel up to 9 miles per charge, and only need 3-4 hrs to fully recharge its battery. The Gotrax is efficient, fun, and well worth its price. If you want to commute to your workplace, school or college in style, the Gotrax GXL will help you do that with its durability, mileage, and stability!